Negative Temperature Coefficient (NTC) thermistors are thermally sensitive semiconductor resistors which exhibit a decrease in resistance as absolute temperature increases. Change in the resistance of NTC thermistor can be brought about either by a change in the ambient temperature or internally by self-heating resulting from current flowing through the device. 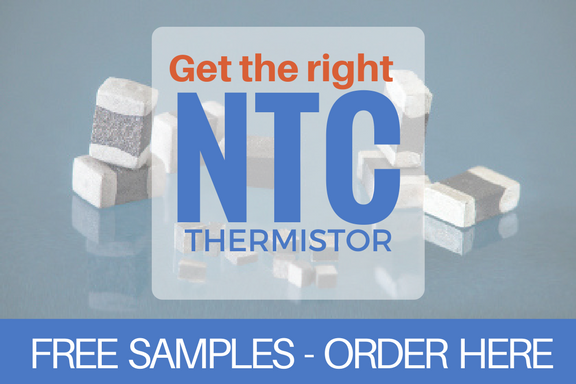 Most of the practical applications of NTC thermistors are based on these material characteristics. RTI manufacturesDISC & CHIPstyle thermistors in resistance values ranging from 1.0 ohm to 500,000 ohms. These devices are suitable for a range of resistance values and temperature coefficients from relatively low resistance and temperature coefficients to very high values. Precision resistance tolerances are available to 1%. Standard resistance tolerances are from 5% to 20%. 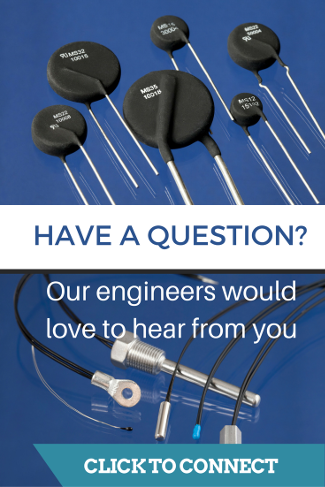 All tolerances are specified at 25°C or may be specified at any temperature within the operating temperature range of the thermistor. D.C. – The dissipation constant is the ratio, normally expressed in milliwatts per degree C (mw/°C), at a specified ambient temperature, of a change in power dissipated in a thermistor to the resultant change in body temperature. T.C.- The thermal time constant is the time required for a thermistor to change 63.2% of the total difference between its initial and final body temperature when subjected to a step function change in temperature under zero-power conditions and is normally expressed in seconds (S). Alpha ( ) or Temperature Coefficient or Resistance- The temperature coefficient of resistance is the ratio at a specified temperature, T, of the rate of change of zero-power resistance with temperature to the zero-power resistance of the thermistor. The temperature coefficient is commonly expressed in percent per degree C (%/°C). Time and temperature are two of the most frequently measured variables. There are numerous ways of the measuring temperature electronically, most commonly by thermocouples and negative temperature coefficient (NTC) thermistors. For general purpose temperature measurement, NTC temperature sensors can operate over a wide temperature range (-55 to +300°C). They are stable throughout a long lifetime, and are small and comparatively inexpensive. Typically, they have negative temperature coefficients between -3.3 and -4.9%/°C at 25°C. This is more than ten (10) times the sensitivity of a platinum resistance thermometer of the same nominal resistance. RTI’sDISC & CHIPstyle thermistors are used in many applications that require a high degree of accuracy and reliability. Power dissipation is a common problem in the use of thermistors as they can only dissipate a certain amount of power. If the power dissipated exceeds the dissipation constant (D.C.) rating of the sensor it is likely that it will exhibit self heating. Most thermistors dissipate from 1 to 25 mW/°C nominal. This means that the resistance changes by an equivalent of 1°C for each D.C. rating (mW/°C) for the selected device. To maintain a higher degree of accuracy, temperature error caused by self-heating should be an order of magnitude less than the required sensor accuracy. For many applications, this degree of accuracy is not required and a less stringent de-rating may be adequate. Several options to reduce the thermistor power are to increase the thermistor resistance, lower the source voltage and/or increase the series resistor in the divider circuit. if the D.C. of the thermistor selected is 5 mW/°C and the power dissipated by the device is 20 mW/°C, then a 4°C error is induced due to the effect of self-heating. To minimize this effect, a factor can be derived simply by taking the DC rating times 10-1(one order of magnitude lower) and use it in the power equation to produce a good approximation of the maximum allowable power. For instance, if the desired accuracy is 1°C, and the rated D.C. of the device selected is 5 mW/°C, adjusting the specified D.C. rating in the power equation to 0.5 mW/°C compensates for self-heating error and effectively predicts the maximum power the device can dissipate without significantly affecting the desired accuracy. The resulting maximum power that should be applied would be calculated as 1°C*0.5mW/°C = 0.5mW.